What are we beginning to learn about PHF’s six strategic priorities for work in the UK? 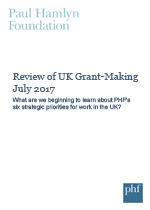 The Review of UK Grant-Making summarises insights and reflections two years on from the launch of the current strategy in 2015 and presents an analysis of grants made to date. This report is part of an ongoing programme of analysis and learning at PHF, for the Board of Trustees, advisers and staff. It was first developed for internal use but we have decided to share it more widely with others who may be interested in our emerging learning.